There are few automotive hobbies more fun than racing and autocrossing. Whether you’re off-roading, getting together for your local Sports Car Club of America meet, racing RC cars, or take racing seriously, pushing the limits of your vehicle in an enclosed but competitive environment is about as much fun as you can have. You don’t have to be a Formula 1 driver to get into racing. Many car lovers partake in amateur racing and autocrossing all the time, either at their local racetrack, a designated open area, or an off-road course. It’s easier to get into racing and autorossing than most people think. You don’t need a fancy, specialized car; many people just have a sports car, or a fun older vehicle that they use to throw around turns and test the brakes on. Whether you’ve got the latest Mustang GT, or an old BMW 2002, racing and autocrossing get the blood pumping, and are about as much fun as you can have behind a wheel. Racing and autocrossing are also a lot more affordable than most people think. Sure, there are some investments to be made, but you don’t need a fancy car, and the fees for track day are usually miniscule. However, there is one important area where you do need to spend some money: safety. You should never race or autocross without proper safety equipment. Furthermore, any quality event won’t let you enter or participate if you don’t have the proper safety gear. One of the most important pieces of safety equipment is the seat belt. The basic three-point seat belt that your vehicle came with can do wonders in a standard accident, but it’s not what you want to have on a vehicle that you’re testing the limits of. Instead, you need a racing harness. Harnesses keep you securely in place, even if you’re in a high-speed accident, or if you roll your vehicle. Furthermore, they also help you stay firmly in position to drive safely, even as you’re accumulating g-forces from whipping your car around turns. If you drift, or are simply slaloming, it’s easy to shift around in your seat, but harnesses keep you firmly in place, so that you can drive effectively. While you can buy 6 or 8-point harnesses if you’re getting really serious about racing, a 5-point harness is the basic option, which will work just fine for most drivers. If you have a stock car that you’re racing in semi-pro events, you’ll need to upgrade, but if all you’re doing is autocrossing, timed laps, and small races, a 5-point harness will get the job done. Just about all of the 5-point harnesses available to purchase are great quality, but that doesn’t stop us from having a few favorites. These are our six go-to models for 5-point harnesses. Add them to your racer or autocross car, and you’ll be good to go. You can probably tell by the name that RaceQuip makes racing equipment. Well, not only do they do that, but they make exceptional racing equipment (spoiler alert: this isn’t their only product that makes this list). The Latch and Lin 5-Point Safety Harness Set is one of the most affordable racing harnesses on our lit, yet you certainly wouldn’t know it from the quality. One of our favorite aspects of this RaceQuip model is that it can be installed with bolts, or with a wraparound method, which makes it easy to install, no matter what vehicle you’re putting it in. 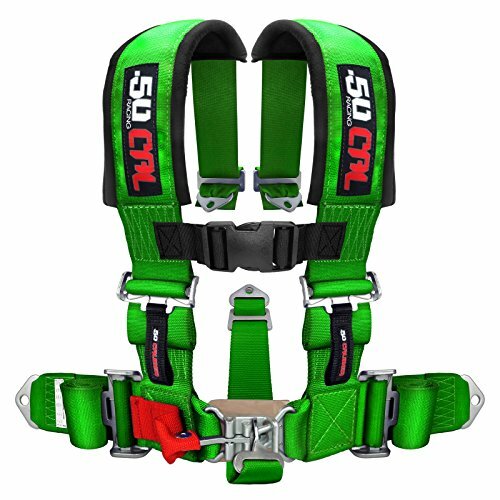 The design of the RaceQuip SFI 16.1 Latch and Link 5-Point Safety Harness Set is virtually flawless. The latch and link system is aided by a pivoting hammer, which allows all of the latches to lock, and then be secured in place. The durability is tremendous, as evidenced by the drop-forged steel and cadmium-plated hardware, and it is SFI-approved. We found that these harnesses always did a good job keeping us secure, and for the most part were very comfortable. Of course, we’re also aware that there are some elements to think of beyond safety. Part of the fun of getting into racing is looking the part. Having a vehicle that looks snazzy, or has a fun paint job, helps you have a good time when racing or autocrossing. Thankfully, the RaceQuip Latch and Link model is available in a few different colors, so you can find a harness that looks best for your racing. Braum Racing is one of our go-to companies when it comes to racing gear. 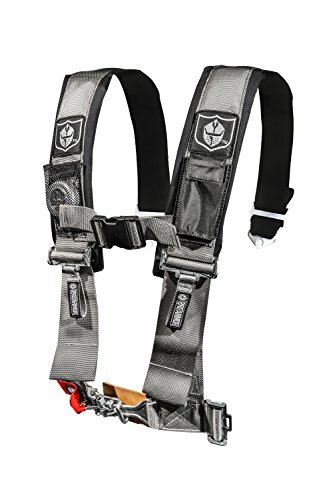 The products they make are exceptional, and this 5-point harness is no exception. This SFI and FIA-approved race harness held us incredibly snugly in our vehicle, making us feel safe and secure while we cornered, and instilling a lot of confidence should an accident occur. The best thing about these harnesses is how they tend to give a little bit of leeway while you’re driving, so that you can be comfortable and fluid in your movements, but they catch the second your vehicle begins to turn. That is conducive to not only great safety, but stellar driving as well. That said, they’re designed to always give you a little bit of wiggle room in the event of an accident, so that your body can safely move with the crash, rather than being rigid and easily damaged. Long story short: when it comes to safety, the Braum Racing 5-Point Racing Harness is about as perfect as it gets. And it doesn’t hurt that it’s a beautiful model, both in design, and in the purple color. It will go well with almost any car. Of course, there’s always a “but”. And for the Braum Racing 5-Point Racing Harness, that “but” is the price tag. It’s the most expensive harness on this list, but as is so often the case, you get what you pay for. If you’re serious about racing or autocrossing, and you have the money, this is absolutely the way to go. You won’t be disappointed; we certainly haven’t been. You can buy the Braum Racing 5-Point Racing Harness SFI 16.1 Certified Seat Belt Camlock here. Don’t let the price tag fool you. This affordable little 5-point harness packs one heck of a punch. The Tanaka Ultra Series Camlock Racing Harness Seat Belt may come in at under $50, and it may have straps that are less wide than most harnesses, but it absolutely gets the job done. We were blown away by just how good this harness was, and we would have easily spent twice as much money on it. The best part is the brilliantly designed camlock, which allows you to fully release the entire belt instantaneously. This not only makes it a lot more practical on a day to day basis, but is critical if you’re in an accident and need to remove yourself from the vehicle in a timely fashion. It’s just one of many features that make the Tanaka harness feel like a professional, extremely trustworthy safety belt. We also were fans of the cast iron mounting hardware. It looked sleek and badass (we felt a little bit like we were in The Fast and the Furious), but more importantly, it felt durable. We’ve definitely had harnesses that were easier to install, but this one wasn’t particularly difficult. A little bit of time with the included hardware, and you’ll be up and running in no time. If you’re on a budget, but you need a 5-point harness, you’ll be giddy with this option. It’s a keeper. 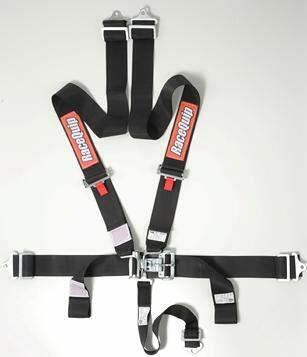 You can buy the Tanaka Ultra Series Camlock Racing Harness Seat Belt here. This 5-point harness from 50 Caliber Racing looks like it’s all business, but it might be one of the more comfortable models that we’ve ever tried. The straps are incredibly secure, but also offer decent padding. We felt immensely locked into place when slaloming, accelerating, and braking, and while we’re grateful that we never tried this harness out in an actual accident, we’re very confident that things would have gone relatively smoothly. If we’re being honest, our favorite thing about the 50 Caliber Racing 5-Point 3-Inch Race Harness was showing up to the track, and seeing people ooh and aah. Admiring each other’s vehicles is a terrific pastime of racing and autocrossing, and this 5-point race harness got a lot of looks. But of course, safety is the biggest concern, and the 50 Caliber Racing model nails that. This is one of the more respected safety harnesses on the market, and for good reason. You’ll have that little bit of extra confidence whipping around the turns when this seat belt is strapping you in. Like we said, RaceQuip would return to this list, and the Platinum Latch and Link 5-Point Auto Racing Harness Set is just as exceptional as its brother, though for a few different reasons. Link the other RaceQuip model, this harness has a terrific latch and link setup that make securing the belt not only a breeze, but extra secure. It also features the same drop-forged steel and cadmium-plated hardware. That said, this model is a bit more bare bones than the other RaceQuip harness, for better and for worse. The polyester straps are remarkably strong, and give you a true professional racing feel and safety. They exceed the SFI-rating, and wildly exceeded our expectations. However, the RaceQuip Platinum Latch and Link 5-Point Auto Racing Harness Set is not certified for use on public roads, so this model is only for those who are really serious about racing and autocrossing, and have a track-only vehicle. However, if that’s you, then you won’t be disappointed. This isn’t the flashiest model, but it gets the job done, and it gets it done well. We felt immensely safe with this 5-point harness wrapped around us, and that’s the most important thing. Not to mention, the price is pretty good too. You can buy the RaceQuip Platinum Latch and Link 5-Point Auto Racing Harness Set here. Pro Armor makes terrific harnesses for anyone interested in racing, but their products are especially revered by those who love testing the limits off road. Simply put, and true to their name, Pro Armor harnesses are tough. How tough, you might ask? Well, this 5-point harness is bullet-proof. Yes, you read that correctly. The Pro Armor 5-Point Harness is also immensely practical, as it has slots in the shoulder straps for both a cellular device, and a music player. There are LED lights built into one of the slots, to help light your cabin when off-roading at night, or if you’re in an accident. Essentially, whatever you might need in an off-roading 5-point harness, this Pro Armor model has. That said, it’s also terrific for road racing and autocrossing. This 5-point harness is incredibly secure, and kept us in place during some intense driving sessions. All things considered, even if you have no interest in off-roading, this is a 5-point harness that you should consider. It’s comfortable, yet feels strong and safe at all times. It’s not the easiest model we’ve ever installed, but with a little bit of time it was very doable. There’s not much to say about this 5-point harness that isn’t positive. As is usually the case when buying something for your car, you should always put a lot of thought into your purchase when getting a 5-point racing harness. As you can probably tell from this article, there are a lot of different factors, ranging from the aesthetics of the harness, to the overall safety, to the comfort, to the ease of use. And of course, the price tag is always an important factor when making a purchase, and as the models on this list show, 5-point harnesses come in a range of prices. Before purchasing a 5-point racing harness, think about what you intend to use it for, how serious you are about racing or autocrossing, and how much money you’re willing to spend on your investment. After that, you should be able to find a model on this list that perfectly fits what you’re looking for. There isn’t anything as near and dear to our hearts as racing and autocrossing. If you feel the same way, or you just want to get started and see if racing is your jam, then you’ll need to purchase a racing harness for your vehicle. Opt for one of the 5-point harnesses in this article, and you’ll be safe, secure, and stylish, every time you hit the track. Have fun out there, and stay safe!